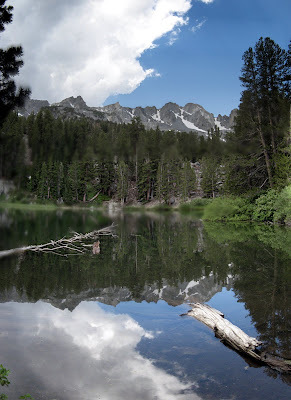 Tour of more sights around Mammoth Lakes, California: Inyo Craters, Earthquake Faults, a hike to Emerald Lake (beautiful in the picture above, but quite the mosquito haven), then a picnic at Horseshoe Lake. 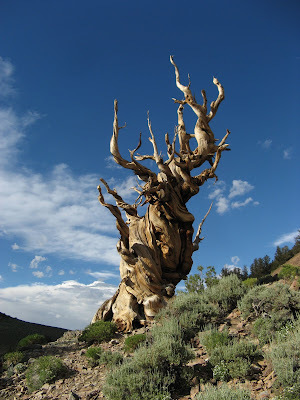 We left Mammoth Lakes and drove down to the Owens Valley, then up again high into the White Mountains to the Ancient Bristlecone Pine Forest in Inyo National Forest, west of Big Pine, California. Some of these amazing trees are over 4000 years old and still living; tree rings of dead trees from the same area date to 9000 years ago. The cool air at 10000 ft was a welcome relief from the heat below. We did the one-mile nature loop hike, had a nice picnic supper, and stopped at an overlook on the drive back to see a glorious cloudy sunset over the High Sierras. It rained on us on the drive down the mountain, but no rain reached the low plains. A great excursion with Elizabeth and Mike to Bodie State Historical Park, a mining ghost town kept in a state of arrested decay, and around Mono Lake in Mono County, California. Special triple feature in the photo album: movies movies movies of Mono Lake alkali flies! Factoid: 80% of California’s coastal sea gulls come to Mono Lake (200 miles inland and 7000 ft elevation) to nest in the summer. Factoid: The Mono Lake brine shrimp are commercially harvested to make fish food. 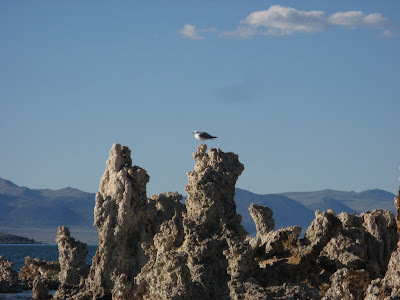 More on Mono Lake from Roughing It by Mark Twain: “Mono Lake lies in a lifeless, treeless, hideous desert, eight thousand feet above the level of the sea, and is guarded by mountains two thousand feet higher, whose summits are always clothed in clouds. This solemn, silent, sailless seaâ€”this lonely tenant of the loneliest spot on earthâ€”is little graced with the picturesque. It is an unpretending expanse of grayish water, about a hundred miles in circumference, with two islands in its centre, mere upheavals of rent and scorched and blistered lava, snowed over with gray banks and drifts of pumice stone and ashes, the winding sheet of the dead volcano, whose vast crater the lake has seized upon and occupied. “The lake is two hundred feet deep, and its sluggish waters are so strong with alkali that if you only dip the most hopelessly soiled garment into them once or twice, and wring it out, it will be found as clean as if it had been through the ablest of washerwomen’s hands. . . .